Prudentius (born in 348 in northern Spain, died after 405) spent most of his life following worldly pursuits, but later turned to writing, in which he aimed to glorify God and atone for his earlier sins. One of his most popular works is a poem called the Psychomachia (Conflict of the Soul), which describes battles between female personifications of virtues and vices. Instead of being a dry theological treatise, the poem has the qualities of an exciting story with high drama and lots of bloodshed and violence. The descriptions of the women, including their clothes, armour, and details of their conflicts, lend themselves to illustration. This copy was apparently written by a scribe of Christ Church, Canterbury. 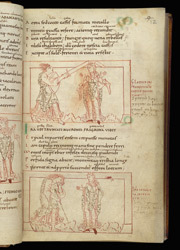 In the upper scene Wrath breaks her sword on Long-Suffering's helmet; in the lower scene Wrath commits suicide by falling on her own spear in despair.